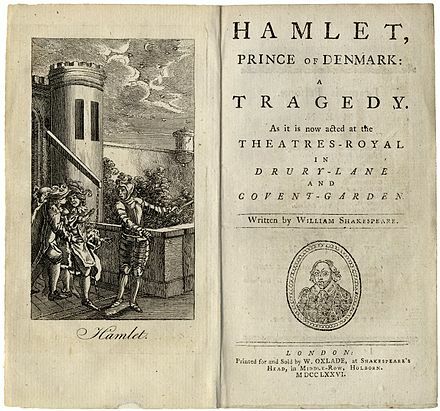 The Tragedy of Hamlet, Prince of Denmark, often shortened to Hamlet ( /ˈhæmlɪt/ ), is a tragedy written by William Shakespeare sometime between 1599 and 1602. Set in Denmark, the play depicts Prince Hamlet and his revenge against his uncle, Claudius, who has murdered Hamlet's father in order to seize his throne and marry Hamlet's mother. Shakespearean tragedy is the designation given to most tragedies written by playwright William Shakespeare. 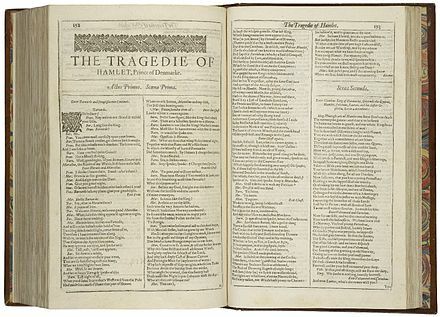 Many of his history plays share the qualifiers of a Shakespearean tragedy, but because they are based on real figures throughout the History of England, they were classified as "histories" in the First Folio. The Roman tragedies—Julius Caesar, Antony and Cleopatra and Coriolanus—are also based on historical figures, but because their source stories were foreign and ancient they are almost always classified as tragedies rather than histories. Shakespeare's romances were written late in his career and published originally as either tragedy or comedy. They share some elements of tragedy featuring a high status central character but end happily like Shakespearean comedies. Several hundred years after Shakespeare's death, scholar F.S. Boas also coined a fifth category, the "problem play," for plays that do not fit neatly into a single classification because of their subject matter, setting, or ending. The classifications of certain Shakespeare plays are still debated among scholars. 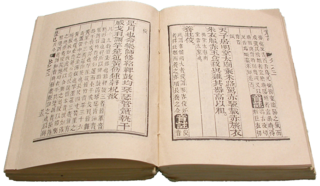 World literature is sometimes used to refer to the sum total of the world's national literatures, but usually it refers to the circulation of works into the wider world beyond their country of origin. Often used in the past primarily for masterpieces of Western European literature, world literature today is increasingly seen in global context. Readers today have access to an unprecedented range of works from around the world in excellent translations, and since the mid-1990s a lively debate has grown up concerning both the aesthetic and the political values and limitations of an emphasis on global processes over national traditions. The story of Shakespeare's Hamlet was derived from the legend of Amleth, preserved by 13th-century chronicler Saxo Grammaticus in his Gesta Danorum , as subsequently retold by the 16th-century scholar François de Belleforest. Shakespeare may also have drawn on an earlier Elizabethan play known today as the Ur-Hamlet , though some scholars believe Shakespeare wrote the Ur-Hamlet, later revising it to create the version of Hamlet we now have. He almost certainly wrote his version of the title role for his fellow actor, Richard Burbage, the leading tragedian of Shakespeare's time. In the 400 years since its inception, the role has been performed by numerous highly acclaimed actors in each successive century. Amleth is a figure in a medieval Scandinavian legend, the direct predecessor of the character of Prince Hamlet, the hero of William Shakespeare's tragedy Hamlet, Prince of Denmark. Saxo Grammaticus, also known as Saxo cognomine Longus, was a Danish historian, theologian and author. He is thought to have been a clerk or secretary to Absalon, Archbishop of Lund, the main advisor to Valdemar I of Denmark. He is the author of the Gesta Danorum, the first full history of Denmark, from which the legend of Amleth would come to inspire the story of Hamlet by Shakespeare. 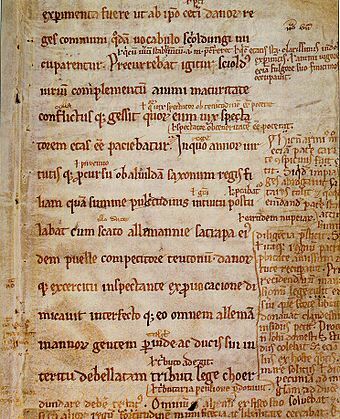 Gesta Danorum is a patriotic work of Danish history, by the 13th century author Saxo Grammaticus. It is the most ambitious literary undertaking of medieval Denmark and is an essential source for the nation's early history. It is also one of the oldest known written documents about the history of Estonia and Latvia. Q1 of Hamlet is a short early text of the Shakespearean play. The intended publication of the play is entered in the Stationers' Register in 1602 by James Roberts, but Q1 was not published until summer or autumn 1603. It was published by the booksellers Nicholas Ling and John Trundell, and printed by Valentine Simmes. Roberts later printed the "Second Quarto" (Q2). Quarto is a book or pamphlet produced from full "blanksheets", each of which is printed with eight pages of text, four to a side, then folded twice to produce four leaves. The leaves are then trimmed along the folds to produce eight book pages. Each printed page presents as one-fourth size of the full blanksheet. King Claudius is a fictional character and the primary antagonist of William Shakespeare's tragedy Hamlet. He is the brother to King Hamlet, second husband to Gertrude and uncle and later stepfather to Prince Hamlet. He obtained the throne of Denmark by murdering his own brother with poison and then marrying the late king's widow. He is loosely based on the Jutish chieftain Feng who appears in Chronicon Lethrense and in Saxo Grammaticus' Gesta Danorum. There had never been an actual Danish King of that name. In William Shakespeare's play Hamlet, Gertrude is Hamlet's mother and Queen of Denmark. Her relationship with Hamlet is somewhat turbulent, since he resents her marrying her husband's brother Claudius after he murdered the king. Gertrude reveals no guilt in her marriage with Claudius after the recent murder of her husband, and Hamlet begins to show signs of jealousy towards Claudius. According to Hamlet, she scarcely mourned her husband's death before marrying Claudius. Fortinbras is either of two minor fictional characters from William Shakespeare's tragedy Hamlet. The more notable is a Norwegian crown prince with a few brief scenes in the play, who delivers the final lines that represent a hopeful future for the monarchy of Denmark and its subjects. Fortinbras is also the name of the former king of Norway and father of the crown prince Fortinbras. King Fortinbras was slain in the play's antecedent action in battle with King Hamlet. The battle between the two is described by Horatio in Act One, Scene One (I,i) of the play. As Polonius's son Laertes prepares to depart for a visit to France, Polonius gives him contradictory advice that culminates in the ironic maxim "to thine own self be true." 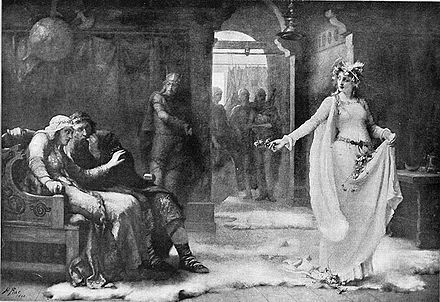 Polonius's daughter, Ophelia, admits her interest in Hamlet, but Laertes warns her against seeking the prince's attention, and Polonius orders her to reject his advances. 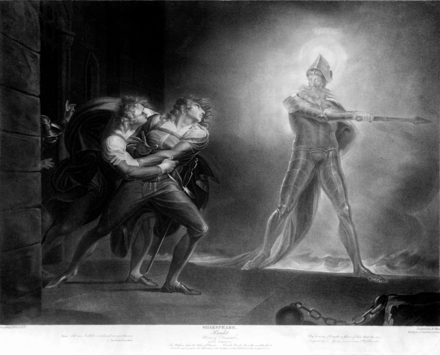 That night on the rampart, the ghost appears to Hamlet, telling the prince that he was murdered by Claudius and demanding that Hamlet avenge him. Hamlet agrees, and the ghost vanishes. The prince confides to Horatio and the sentries that from now on he plans to "put an antic disposition on", or act as though he has gone mad, and forces them to swear to keep his plans for revenge secret. Privately, however, he remains uncertain of the ghost's reliability. "Any dating of Hamlet must be tentative", cautions the New Cambridge editor, Phillip Edwards. [lower-alpha 4] The earliest date estimate relies on Hamlet's frequent allusions to Shakespeare's Julius Caesar , itself dated to mid-1599. The latest date estimate is based on an entry, of 26 July 1602, in the Register of the Stationers' Company, indicating that Hamlet was "latelie Acted by the Lo: Chamberleyne his servantes". From the early 17th century, the play was famous for its ghost and vivid dramatisation of melancholy and insanity, leading to a procession of mad courtiers and ladies in Jacobean and Caroline drama. Though it remained popular with mass audiences, late 17th-century Restoration critics saw Hamlet as primitive and disapproved of its lack of unity and decorum. This view changed drastically in the 18th century, when critics regarded Hamlet as a hero—a pure, brilliant young man thrust into unfortunate circumstances. By the mid-18th century, however, the advent of Gothic literature brought psychological and mystical readings, returning madness and the ghost to the forefront. 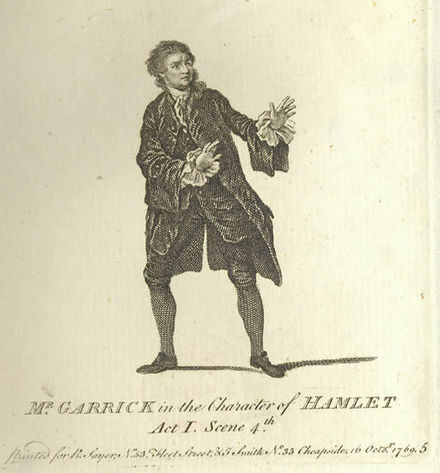 Not until the late 18th century did critics and performers begin to view Hamlet as confusing and inconsistent. Before then, he was either mad, or not; either a hero, or not; with no in-betweens. These developments represented a fundamental change in literary criticism, which came to focus more on character and less on plot. By the 19th century, Romantic critics valued Hamlet for its internal, individual conflict reflecting the strong contemporary emphasis on internal struggles and inner character in general. Then too, critics started to focus on Hamlet's delay as a character trait, rather than a plot device. This focus on character and internal struggle continued into the 20th century, when criticism branched in several directions, discussed in context and interpretation below. Hamlet is Shakespeare's longest play. The Riverside edition constitutes 4,042 lines totaling 29,551 words, typically requiring over four hours to stage. [lower-alpha 8] It is rare that the play is performed without some abridgments, and only one film adaptation has used a full-text conflation: Kenneth Branagh's 1996 version, which runs slightly more than four hours. Hamlet is often perceived as a philosophical character, expounding ideas that are now described as relativist, existentialist, and sceptical. 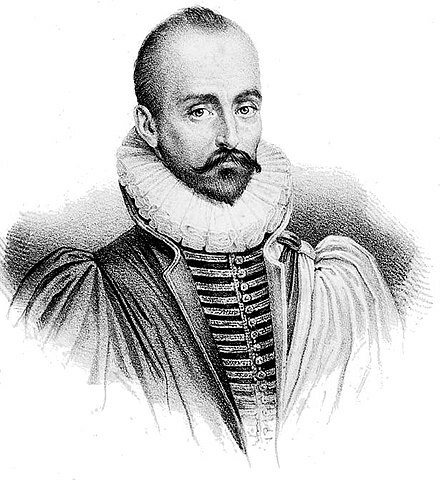 For example, he expresses a subjectivistic idea when he says to Rosencrantz: "there is nothing either good or bad, but thinking makes it so". The idea that nothing is real except in the mind of the individual finds its roots in the Greek Sophists, who argued that since nothing can be perceived except through the senses—and since all individuals sense, and therefore perceive things differently—there is no absolute truth, but rather only relative truth. The clearest alleged instance of existentialism is in the "to be, or not to be"  speech, where Hamlet is thought by some to use "being" to allude to life and action, and "not being" to death and inaction. Beginning in 1910, with the publication of "The Œdipus-Complex as an Explanation of Hamlet's Mystery: A Study in Motive"  Ernest Jones—a psychoanalyst and Freud's biographer—developed Freud's ideas into a series of essays that culminated in his book Hamlet and Oedipus (1949). 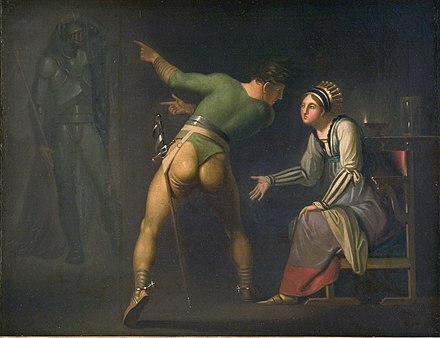 Influenced by Jones's psychoanalytic approach, several productions have portrayed the "closet scene", where Hamlet confronts his mother in her private quarters, in a sexual light. [lower-alpha 13] In this reading, Hamlet is disgusted by his mother's "incestuous" relationship with Claudius while simultaneously fearful of killing him, as this would clear Hamlet's path to his mother's bed. Ophelia's madness after her father's death may also be read through the Freudian lens: as a reaction to the death of her hoped-for lover, her father. Ophelia is overwhelmed by having her unfulfilled love for him so abruptly terminated and drifts into the oblivion of insanity. In 1937, Tyrone Guthrie directed Laurence Olivier in a Jones-inspired Hamlet at The Old Vic. Olivier later used some of these same ideas in his 1948 film version of the play. In the 1920s, James Joyce managed "a more upbeat version" of Hamlet—stripped of obsession and revenge—in Ulysses , though its main parallels are with Homer's Odyssey . In the 1990s, two novelists were explicitly influenced by Hamlet. In Angela Carter's Wise Children , To be or not to be  is reworked as a song and dance routine, and Iris Murdoch's The Black Prince has Oedipal themes and murder intertwined with a love affair between a Hamlet-obsessed writer, Bradley Pearson, and the daughter of his rival. In the late 20th century, David Foster Wallace's novel Infinite Jest draws heavily from Hamlet and takes its title from the play's text; Wallace incorporates references to the gravedigger scene, the marriage of the main character's mother to his uncle, and the re-appearance of the main character's father as a ghost. Notable stagings in London and New York include Barrymore's 1925 production at the Haymarket; it influenced subsequent performances by John Gielgud and Laurence Olivier. Gielgud played the central role many times: his 1936 New York production ran for 132 performances, leading to the accolade that he was "the finest interpreter of the role since Barrymore". Although "posterity has treated Maurice Evans less kindly", throughout the 1930s and 1940s he was regarded by many as the leading interpreter of Shakespeare in the United States and in the 1938/39 season he presented Broadway's first uncut Hamlet, running four and a half hours. Evans later performed a highly truncated version of the play that he played for South Pacific war zones during World War II which made the prince a more decisive character. The staging, known as the "G.I. 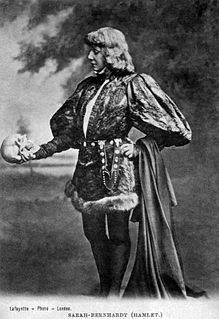 Hamlet", was produced on Broadway for 131 performances in 1945/46. Olivier's 1937 performance at The Old Vic was popular with audiences but not with critics, with James Agate writing in a famous review in The Sunday Times, "Mr. Olivier does not speak poetry badly. He does not speak it at all." In 1937 Tyrone Guthrie directed the play at Elsinore, Denmark with Laurence Olivier as Hamlet and Vivien Leigh as Ophelia. In October 2011, a production starring Michael Sheen opened at the Young Vic, in which the play was set inside a psychiatric hospital.  . In 1942, Ernst Lubitsch directed a motion picture titled To Be or Not To Be . The story is a comedy about a troupe of Polish actors in the Nazi era. A key plot point revolves around the famous soliloquy. The story was remade in 1983 in a film starring (and produced by) Mel Brooks. Renowned Shakespearean actor-directors Sir John Gielgud, Sir Laurence Olivier and Sir Kenneth Branagh consider the definitive rendition of the play  to be the 1964 Soviet film Gamlet (Russian: Гамлет) based on a translation by Boris Pasternak and directed by Grigori Kozintsev, with a score by Dmitri Shostakovich. 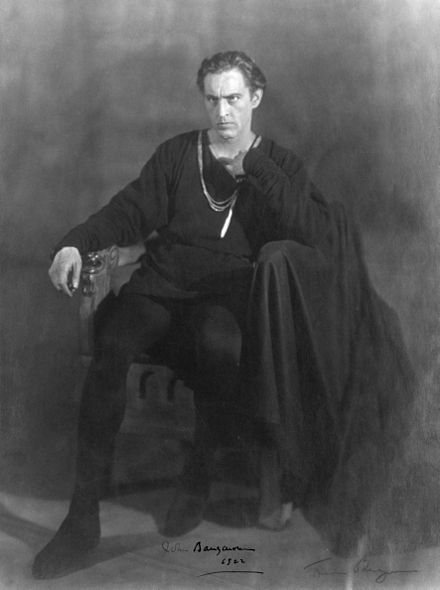 Innokenty Smoktunovsky was cast in the role of Hamlet. John Gielgud directed Richard Burton in a Broadway production at the Lunt-Fontanne Theatre in 1964–5, the longest-running Hamlet in the U.S. to date. A live film of the production was produced using "Electronovision", a method of recording a live performance with multiple video cameras and converting the image to film. 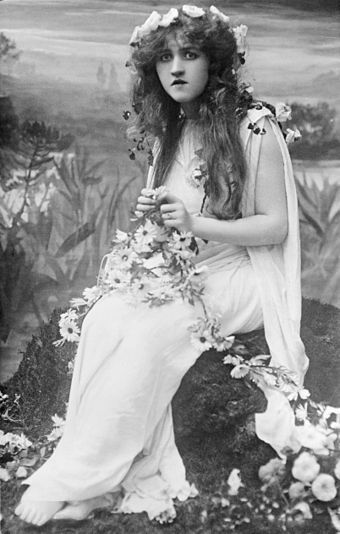 Eileen Herlie repeated her role from Olivier's film version as the Queen, and the voice of Gielgud was heard as the ghost. The Gielgud/Burton production was also recorded complete and released on LP by Columbia Masterworks. In 1990 Franco Zeffirelli, whose Shakespeare films have been described as "sensual rather than cerebral",  cast Mel Gibson—then famous for the Mad Max and Lethal Weapon movies—in the title role of his 1990 version; Glenn Close—then famous as the psychotic "other woman" in Fatal Attraction —played Gertrude,  and Paul Scofield played Hamlet's father. There have also been several films that transposed the general storyline of Hamlet or elements thereof to other settings. For example, the 2014 Bollywood film Haider is an adaptation set in Kashmir. There have also been many films which included performances of scenes from Hamlet as a play-within-a-film. ↑ See Romans 12:19: Vengeance is mine; I will repay, saith the Lord. 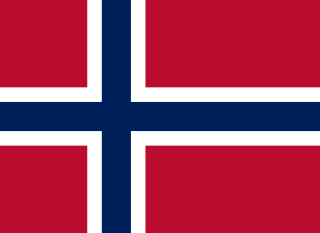 ↑ See the articles on the Reformation in Denmark–Norway and Holstein and Church of Denmark for details. ↑ Hamlet has 208 quotations in The Oxford Dictionary of Quotations ; it takes up 10 of 85 pages dedicated to Shakespeare in the 1986 Bartlett's Familiar Quotations (14th ed. 1968) . For examples of lists of the greatest books, see Harvard Classics, Great Books, Great Books of the Western World, Harold Bloom's The Western Canon, St. John's College reading list, and Columbia College Core Curriculum. ↑ According to the Internet Broadway Database Romeo and Juliet is the second most-produced Shakespeare play on Broadway, with thirty-four different productions, followed by Twelfth Night , with thirty. Rosencrantz and Guildenstern Are Dead, often referred to as just Rosencrantz and Guildenstern, is an absurdist, existential tragicomedy by Tom Stoppard, first staged at the Edinburgh Festival Fringe in 1966. The play expands upon the exploits of two minor characters from Shakespeare's Hamlet, the courtiers Rosencrantz and Guildenstern. The main setting is Denmark. Hamlet is a 1996 film adaptation of William Shakespeare's play Hamlet, adapted and directed by Kenneth Branagh, who also stars as Prince Hamlet. The film also features Derek Jacobi as King Claudius, Julie Christie as Queen Gertrude, Kate Winslet as Ophelia, Michael Maloney as Laertes, Richard Briers as Polonius, and Nicholas Farrell as Horatio. Other cast members include Robin Williams, Gérard Depardieu, Jack Lemmon, Billy Crystal, Rufus Sewell, Charlton Heston, Richard Attenborough, Judi Dench, John Gielgud and Ken Dodd. Hamlet, also known as Hamlet 2000, is a 2000 American drama film written and directed by Michael Almereyda, set in contemporary New York City, and based on the Shakespeare play of the same name. Ethan Hawke plays Hamlet as a film student, Kyle MacLachlan co-stars as Uncle Claudius, with Diane Venora as Gertrude, Liev Schreiber as Laertes, Julia Stiles as Ophelia, Steve Zahn as Rosencrantz, Bill Murray as Polonius, and Sam Shepard as Hamlet's father. Polonius is a character in William Shakespeare's Hamlet. He is chief counsellor of the king, and the father of Laertes and Ophelia. 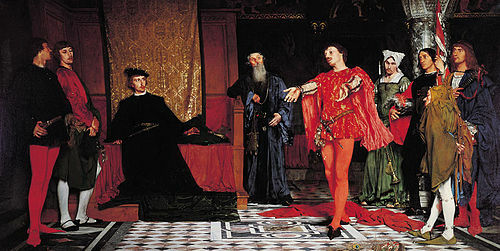 Generally regarded as wrong in every judgment he makes over the course of the play, Polonius is described by William Hazlitt as a "sincere" father, but also "a busy-body, [who] is accordingly officious, garrulous, and impertinent". In Act II Hamlet refers to Polonius as a "tedious old fool" and taunts him as a latter day "Jeptha". Gertrude and Claudius is a novel by John Updike. It uses the known sources of Shakespeare's Hamlet to tell a story that draws on a rather straightforward revenge tale in the medieval Denmark depicted by Saxo Grammaticus in his twelfth-century Historiae Danicae, but incorporates extra plot elements added by François de Belleforest in his Histoires tragiques, published in 1576. 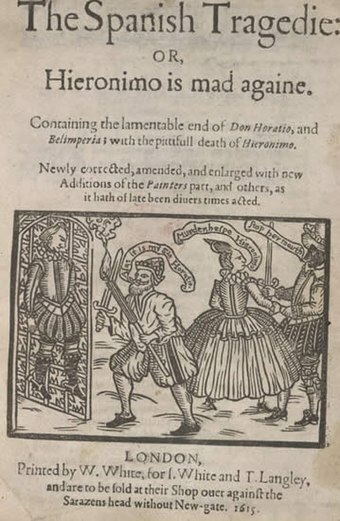 And, finally, it brings in various elements from Shakespeare's play, including the name "Corambis" for Polonius from the "bad quarto" of 1603. This story, in its three forms, is primarily concerned with Hamlet avenging his father's murder, but the story starts earlier. The novel is concerned with that earlier life of Gertrude, Claudius, and old Hamlet, and it ends at the close of Act I, scene ii of Hamlet. From its premiere at the turn of the 17th century, Hamlet has remained Shakespeare's best-known, most-imitated, and most-analyzed play. The character of Hamlet played a critical role in Sigmund Freud's explanation of the Oedipus complex and thus influenced modern psychology. Even within the narrower field of literature, the play's influence has been strong. As Foakes writes, "No other character's name in Shakespeare's plays, and few in literature, have come to embody an attitude to life ... and been converted into a noun in this way." 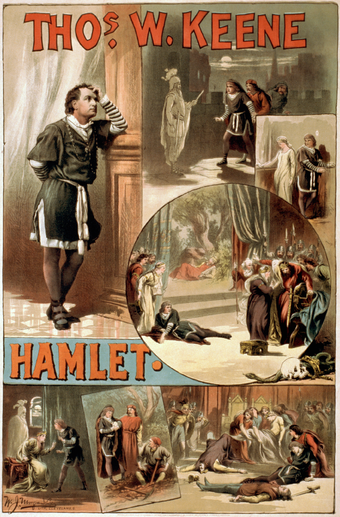 Over fifty films of William Shakespeare's Hamlet have been made since 1900. Seven post-war Hamlet films have had a theatrical release: Laurence Olivier's Hamlet of 1948; Grigori Kozintsev's 1964 Russian adaptation; a film of the John Gielgud-directed 1964 Broadway production, Richard Burton's Hamlet, which played limited engagements that same year; Tony Richardson's 1969 version featuring Nicol Williamson as Hamlet and Anthony Hopkins as Claudius; Franco Zeffirelli's 1990 version starring Mel Gibson; Kenneth Branagh's full-text 1996 version; and Michael Almereyda's 2000 modernisation, starring Ethan Hawke. 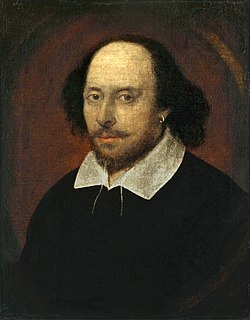 What follows is an overview of the main characters in William Shakespeare's Hamlet, followed by a list and summary of the minor characters from the play. 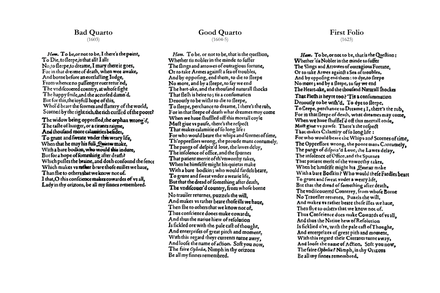 Three different early versions of the play survive: known as the First Quarto ("Q1"), Second Quarto ("Q2"), and First Folio ("F1"), each has lines—and even scenes—missing in the others, and some character names vary. Rosencrantz and Guildenstern, A Tragic Episode, in Three Tabloids is a short comic play by W. S. Gilbert, a parody of Hamlet by William Shakespeare. The main characters in Gilbert's play are King Claudius and Queen Gertrude of Denmark, their son Prince Hamlet, the courtiers Rosencrantz and Guildenstern, and Ophelia. 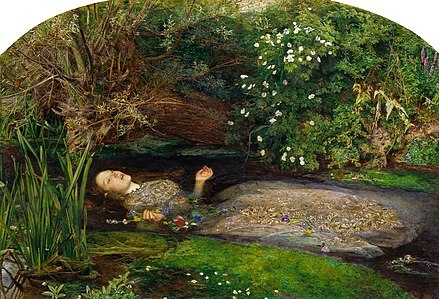 Ophelia is a character in William Shakespeare's drama Hamlet. She is a young noblewoman of Denmark, the daughter of Polonius, sister of Laertes, and potential wife of Prince Hamlet. Hamlet is a 2009 television film adaptation of the Royal Shakespeare Company's 2008 modern-dress stage production of William Shakespeare's play of the same name, aired on BBC Two on 26 December 2009. It was broadcast by PBS' Great Performances in the United States on 28 April 2010. Hamlet is a 1913 British silent drama film directed by Hay Plumb and starring Johnston Forbes-Robertson, Gertrude Elliot and Walter Ringham. It is an adaptation of the play Hamlet by William Shakespeare made by the Hepworth Company and based on the Drury Lane Theatre's 1913 staging of the work. 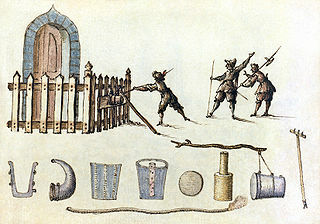 "Hoist with his own petard" is a phrase from a speech in William Shakespeare's play Hamlet that has become proverbial. The phrase's meaning is literally that the bomb-maker is blown up by his own bomb, and indicates an ironic reversal, or poetic justice. Hamlet is a 1961 German mystery drama film directed by Franz Peter Wirth. The screenplay by Wirth is adapted from the William Shakespeare tragedy of the same name. The film was initially broadcast on television on 1 January 1961 in West Germany before being released theatrically in the United States in 1962. Hamlet. XXI Century is a 2009 four-episode television miniseries by Yuri Kara. It is an adaptation and modernization of William Shakespeare's tragedy Hamlet. All references to Hamlet, unless otherwise specified, are taken from the Arden Shakespeare Q2. Under their referencing system, 3.1.55 means act 3, scene 1, line 55. 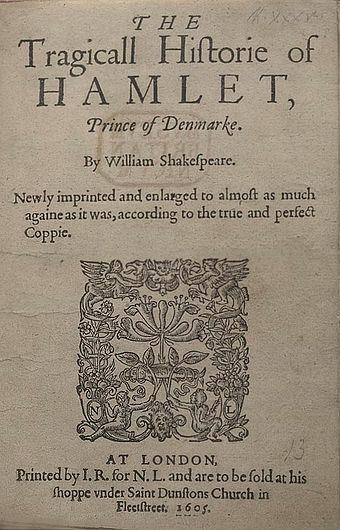 References to the First Quarto and First Folio are marked Hamlet Q1 and Hamlet F1, respectively, and are taken from the Arden Shakespeare Hamlet: the texts of 1603 and 1623. Their referencing system for Q1 has no act breaks, so 7.115 means scene 7, line 115. ↑ Thompson & Taylor 2006a, p. 74. 1 2 Taylor 2002, p. 18. ↑ Crystal & Crystal 2005, p. 66. ↑ Thompson & Taylor 2006a, p. 17. ↑ Trilling 2009, p. 8. ↑ Saxo & Hansen 1983, pp. 36–7. ↑ Saxo & Hansen 1983, pp. 16–25. ↑ Saxo & Hansen 1983, pp. 5–15. ↑ Saxo & Hansen 1983, pp. 1–5. ↑ Saxo & Hansen 1983, pp. 25–37. ↑ Edwards 1985, pp. 1–2. ↑ Saxo & Hansen 1983, pp. 66–7. ↑ Jenkins 1982, pp. 82–5. ↑ Saxo & Hansen 1983, p. 67. ↑ Jackson 1991, p. 267. ↑ Bloom 2001, pp. xiii,383. ↑ Bloom 2003, p. 154. ↑ Jenkins 1982, p. 84 n4. ↑ Saxo & Hansen 1983, pp. 66–8. ↑ Saxo & Hansen 1983, p. 6. ↑ Greenblatt 2004a, p. 311. ↑ Chambers 1930, p. 418. ↑ Wilson 1932, p. 104. ↑ Rowse 1963, p. 323. ↑ Winstanley 1977, p. 114. ↑ Jenkins 1982, p. 35. ↑ Hibbard 1987, pp. 74–5. ↑ MacCary 1998, p. 13. ↑ Shapiro 2005, p. 341. ↑ Wells & Taylor 1988, p. 653. ↑ Edwards 1985, p. 8. 1 2 3 Lott 1970, p. xlvi. ↑ Thompson & Taylor 2006a, p. 58–9. ↑ MacCary 1998, pp. 12–13. ↑ Edwards 1985, pp. 5–6. ↑ Duncan-Jones 2001, pp. 143–9. ↑ Edwards 1985, p. 5. ↑ Hattaway 1987, pp. 13–20. ↑ Chambers 1923b, pp. 486–7. ↑ Halliday 1964, pp. 204–5. ↑ Thompson & Taylor 2006a, p. 465. 1 2 Halliday 1964, p. 204. 1 2 Thompson & Taylor 2006a, p. 78. ↑ Hibbard 1987, pp. 22–3. ↑ Hattaway 1987, p. 16. 1 2 Thompson & Taylor 2006a. 1 2 Thompson & Taylor 2006b. ↑ Bate & Rasmussen 2007, p. 1923. ↑ Hamlet 3.4 and 4.1. ↑ Thompson & Taylor 2006a, pp. 543–52. ↑ Jenkins 1982, p. 14. ↑ Irace 1998, pp. 1–34. ↑ Jackson 1986, p. 171. ↑ Thompson & Taylor 2006a, pp. 85–6. ↑ Thompson & Taylor 2006b, pp. 36–9. ↑ Thompson & Taylor 2006a, pp. 18–19. ↑ Bate & Rasmussen 2008, p. 11. ↑ Crowl 2014, pp. 5–6. ↑ Vickers 1974a, p. 447. ↑ Vickers 1974b, p. 92. ↑ Wofford 1994, p. 184–5. ↑ Vickers 1974c, p. 5. ↑ Wofford 1994, p. 185. 1 2 Wofford 1994, p. 186. ↑ Rosenberg 1992, p. 179. ↑ MacCary 1998, pp. 67–72, 84. ↑ Kermode 2000, p. 256. ↑ MacCary 1998, pp. 84–5. ↑ MacCary 1998, pp. 89–90. 1 2 Kiernan 2007, p. 34. 1 2 Jenkins 1982, pp. 493–5. ↑ MacCary 1998, pp. 87–8. ↑ MacCary 1998, pp. 91–3. ↑ MacCary 1998, pp. 37–8. ↑ MacCary 1998, p. 38. ↑ MacCary 1998, pp. 47–8. 1 2 MacCary 1998, p. 49. ↑ Knowles 1999, pp. 1049, 1052–3. ↑ Thompson & Taylor 2006a, pp. 73–4. ↑ Bloom 1994, p. 381. ↑ Freud 1900, pp. 367–8. 1 2 3 Freud & Brill 1995, p. 274-9. ↑ Budd 2005, pp. 112. 1 2 Freud & Brill 1995, p. 278. ↑ Freud & Bunker 1960, p. 147. ↑ Freud & Bunker 1960, p. 147-8. ↑ Morrison 1997, pp. 4, 129–30. ↑ Cotsell 2005, p. 191. ↑ MacCary 1998, pp. 104–7, 113–16. ↑ de Grazia 2007, pp. 168–70. ↑ Smallwood 2002, p. 102. 1 2 Bloom & Foster 2008, p. xii. 1 2 3 4 Britton 1995, pp. 207–11. ↑ Wofford 1994, pp. 199–202. ↑ Howard 2003, pp. 411–15. ↑ Bloom 2003, pp. 58–9. ↑ Thompson 2001, p. 4. ↑ Bloom 2003, p. 57. ↑ MacCary 1998, pp. 111–13. ↑ Osborne 2007, pp. 114–33. ↑ Kerrigan 1996, p. 122. ↑ Warren 2016, p. 367. ↑ Warren 2016, p. 379. 1 2 3 4 5 Thompson & Taylor 2006a, pp. 123–6. ↑ Welsh 2001, p. 131. 1 2 Thompson & Taylor 2006a, pp. 126–31. ↑ Novy 1994, pp. 62, 77–8. ↑ Braun 1982, p. 40. ↑ Taylor 2002, p. 4. ↑ Banham 1998, p. 141. ↑ Hattaway 1982, p. 91. ↑ Thomson 1983, p. 24. ↑ Thomson 1983, p. 110. ↑ Taylor 2002, p. 13. ↑ Thompson & Taylor 2006a, pp. 53–5. ↑ Chambers 1930, p. 334. 1 2 Dawson 2002, p. 176. ↑ Pitcher & Woudhuysen 1969, p. 204. ↑ Hibbard 1987, p. 17. ↑ Marsden 2002, p. 21. ↑ Holland 2007, p. 34. ↑ Marsden 2002, pp. 21–2. ↑ Thompson & Taylor 1996, p. 57. ↑ Taylor 1989, p. 16. ↑ Thompson & Taylor 2006a, pp. 98–9. ↑ Uglow 1977, p. 473. ↑ Morrison 2002, p. 231. ↑ Moody 2002, p. 41. ↑ Gay 2002, p. 159. ↑ Dawson 2002, pp. 185–7. ↑ Morrison 2002, pp. 232–3. ↑ Morrison 2002, pp. 235–7. 1 2 Morrison 2002, p. 241. ↑ Schoch 2002, pp. 58–75. ↑ Shaw 1961, p. 81. ↑ Moody 2002, p. 54. ↑ O'Connor 2002, p. 77. ↑ Gay 2002, p. 164. ↑ Holland 2002, pp. 203–5. ↑ Dawson 2002, p. 184. ↑ Dawson 2002, p. 188. 1 2 3 Gillies et al. 2002, pp. 259–62. ↑ Dawson 2002, p. 180. ↑ Benedetti 1999, pp. 188–211. ↑ Benedetti 1999, pp. 189, 195. ↑ Taxidou 1998, pp. 38–41. 1 2 Innes 1983, p. 153. ↑ Taxidou 1998, p. 181, 188. ↑ Innes 1983, p. 152. ↑ Innes 1983, pp. 165–7. ↑ Innes 1983, p. 172. ↑ Innes 1983, pp. 140–75. ↑ Hortmann 2002, p. 214. ↑ Hortmann 2002, p. 223. ↑ Hortmann 2002, pp. 224–5. 1 2 3 Gillies et al. 2002, pp. 267–9. ↑ Morrison 2002, pp. 247–8. ↑ Thompson & Taylor 2006a, p. 109. ↑ Morrison 2002, p. 249. ↑ Morrison 2002, pp. 249–50. ↑ Blum 1981, p. 307. ↑ Smallwood 2002, p. 108. ↑ Guernsey & Sweet 2000, p. 43. ↑ McKellen et al. 1990, p. 124. ↑ Barratt 2005, p. 63. ↑ Davison 1999, pp. 170–82. ↑ Spencer, Charles. "Hamlet, The Young Vic Theatre: review". Daily Telegraph. Daily Telegraph. Retrieved 18 March 2019. ↑ Globe to Globe Hamlet n.d.
1 2 3 Brode 2001, pp. 117–18. ↑ Davies 2000, p. 171. ↑ Guntner 2000, pp. 120–1. ↑ Brode 2001, pp. 125–7. ↑ Cartmell 2000, p. 212. ↑ Guntner 2000, pp. 121–2. ↑ Crowl 2000, p. 232. ↑ Starks 1999, p. 272. ↑ Keyishian 2000, pp. 78–9. ↑ Gilbert 1892, pp. 349–66. Billington, Michael (4 May 2001). "Hamlet—Royal Shakespeare Theatre, Stratford Upon Avon". Theatre. The Guardian . London. Billington, Michael (6 August 2008). "Hamlet—Courtyard, Stratford-upon-Avon". Theatre. The Guardian . London. Brandes, Philip (5 July 2001). "A Viking Helmet for Hamlet in Satirical Mad Boy Chronicle". Los Angeles Times . Retrieved 20 December 2017. Brennan, Sandra (n.d.). "Innokenti Smoktunovsky". The New York Times . Archived from the original on 18 February 2015. Retrieved 29 May 2010. Brown, Mark (1 April 2016). "Sherlock star Andrew Scott to play Hamlet in new UK production". Theatre. The Guardian . London. Retrieved 22 July 2016. Brown, Mark (11 April 2018). "Shakespeare's Globe casts its own artistic director as Hamlet". Theatre. The Guardian . London. Burnett, Mark Thornton (2003). "'To Hear and See the Matter': Communicating Technology in Michael Almereyda's Hamlet (2000)". Cinema Journal . 42 (3): 48–69. doi:10.1353/cj.2003.0007. ISSN 1527-2087. JSTOR 1225904 – via JSTOR. (Subscription required (help)). Burrow, Colin (19 May 2002). "Will the real Hamlet please stand up?" . The Times . p. 6 – via InfoTrac Newsstand. Calia, Michael (11 August 2014). "Benedict Cumberbatch as 'Hamlet' Opens Next Year, And Is Now Sold Out". Speakeasy. The Wall Street Journal . Canby, Vincent (3 May 1995). "Ralph Fiennes as Mod Hamlet". The New York Times . Retrieved 21 July 2016. "Jude Law to play Hamlet at 'home' Kronborg Castle". The Daily Mirror . 10 July 2009. Retrieved 14 July 2009. Fine, Marshall (10 April 2013). "Paul Giamatti in Hamlet". Onstage. The Huffington Post . Retrieved 11 July 2015. Fox, Margalit (18 September 2009). "Jack Manning, Character Actor, Dies at 93". Theater. The New York Times . Retrieved 14 September 2013. Freud, Sigmond; Bunker, Henry Alden (1960). "Psychopathic Characters on the Stage". The Tulane Drama Review . The MIT Press. 4 (3): 144–148. doi:10.2307/1124852. ISSN 0886-800X. JSTOR 1124852 – via JSTOR. (Registration required (help)). Freud, Sigmund (1991) . Richards, Angela, ed. The Interpretation of Dreams . The Penguin Freud Library. 4. Translated by Strachey, James. London: Penguin. ISBN 0-14-013794-7. Gardner, Lyn (8 November 2002). "Hamlet—West Yorkshire Playhouse, Leeds". Theatre. The Guardian . London. Gilbert, W. S. (1892). "Rosencrantz and Guildenstern". Foggerty's Fairy: and other tales. London: George Routledge & Sons . Retrieved 27 June 2016. Greenblatt, Stephen (21 October 2004). "The Death of Hamnet and the Making of Hamlet". The New York Review of Books . Vol. 51 no. 16. Grode, Eric (30 March 2011). "Dueling Mentors Bedevil a Dithering Young Dane". Theater Reviews. The New York Times . Retrieved 10 December 2011. Gupta, Priya (7 February 2014). "Bollywood returns to their favourite destination Kashmir". The Times of India . Retrieved 10 February 2018. Gussow, Mel (3 April 1992). "A High-Keyed 'Hamlet' Starring Stephen Lang". The New York Times . Retrieved 13 July 2016. Gussow, Mel (14 October 1992). "Theater in Review". Theater. The New York Times . Retrieved 26 June 2011. Heilbrun, Carolyn (1957). "The Character of Hamlet's Mother". Shakespeare Quarterly . 8 (2): 201–6. doi:10.2307/2866964. eISSN 1538-3555. ISSN 0037-3222. JSTOR 2866964 – via JSTOR. (Subscription required (help)). Hirrel, Michael J. (2010). "Duration of Performances and Lengths of Plays: How Shall We Beguile the Lazy Time?". Shakespeare Quarterly . Folger Shakespeare Library. 61 (2): 159–82. doi:10.1353/shq.0.0140. eISSN 1538-3555. ISSN 0037-3222. JSTOR 40731154 – via JSTOR. (Registration required (help)). Itzkoff, Dave (30 June 2009). "Donmar Warehouse's 'Hamlet' Coming to Broadway With Jude Law". ArtsBeat. The New York Times . Retrieved 10 September 2009. Jones, Ernest (1910). "The Œdipus-Complex as an Explanation of Hamlet's Mystery: A Study in Motive". The American Journal of Psychology . University of Illinois Press. 21 (1): 72–113. doi:10.2307/1412950. eISSN 1939-8298. ISSN 0002-9556. JSTOR 1412950 – via JSTOR. (Registration required (help)). Kirsch, Arthur C. (1969). "A Caroline Commentary on the Drama". Modern Philology . The University of Chicago Press. 66 (3): 256–61. doi:10.1086/390087. eISSN 1545-6951. JSTOR 436454 – via JSTOR. (Registration required (help)). Knowles, Ronald (1999). "Hamlet and Counter-Humanism". Renaissance Quarterly . Renaissance Society of America. 52 (4): 1046–69. doi:10.2307/2901835. eISSN 1935-0236. JSTOR 2901835 – via JSTOR. (Registration required (help)). Law, Jude (2 October 2009). "Shakespeare's Hamlet with Jude Law". Charlie Rose (Interview). Interviewed by Charlie Rose. PBS . Retrieved 6 October 2009. "Hamlet 1963". Royal National Theatre . n.d. Archived from the original on 11 August 2010. Retrieved 21 July 2016. Panagako, Ari (14 June 1978). "Dandy Hamlet Bows Uptown". Heights/Inwood Press of North Manhattan . Rothman, Joshua (14 August 2013). "Hamlet: A Love Story". The New Yorker . Retrieved 20 July 2016. Schultz, David G. (16 July 2008). "A Play at Poolside: Caridad Svich's 12 Ophelias". The Brooklyn Rail . Retrieved 26 June 2011. Shenton, Mark (10 September 2007). "Jude Law to star in Donmar's Hamlet". The Stage . Retrieved 19 November 2007. (Subscription required (help)). Stewart, Rachel (11 August 2014). "Cumberbatch's Hamlet most in-demand show of all time". The Daily Telegraph . London. Sulcas, Roslyn (1 August 2017). "Kenneth Branagh to Direct Tom Hiddleston in 'Hamlet'". Theater. The New York Times . Retrieved 21 December 2017. Todoroff, Aimee (19 March 2011). "Wittenberg". Nytheatre.com . Archived from the original on 23 October 2017. Retrieved 23 October 2017. Warren, Christopher N. (2016). "Big Leagues: Specters of Milton and Republican International Justice between Shakespeare and Marx". Humanity . University of Pennsylvania Press. 7 (3): 365–89. doi:10.1353/hum.2016.0020. ISSN 2151-4372 – via Project MUSE. (Subscription required (help)). Winter, William (26 October 1875). 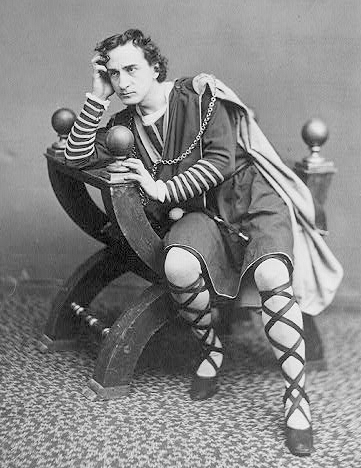 "Fifth Avenue Theater—Edwin Booth as Hamlet". The Drama. New-York Tribune . p. 5. ISSN 1941-0646. LCCN sn83030214. OCLC 9405688. Zhuk, Nataliia (2 September 2017). "Tom Hiddleston in Hamlet review: A Supremely Self-Assured Prince - Rada's Jerwood Vanbrugh Theatre". The Telegraph . ISSN 0307-1235. Hamlet —Annotated text aligned to Common Core standards. The Danish History (Books I-IX) by Saxo Grammaticus at The Online Medieval & Classical Library (public domain translation into English of the Gesta Danorum ).